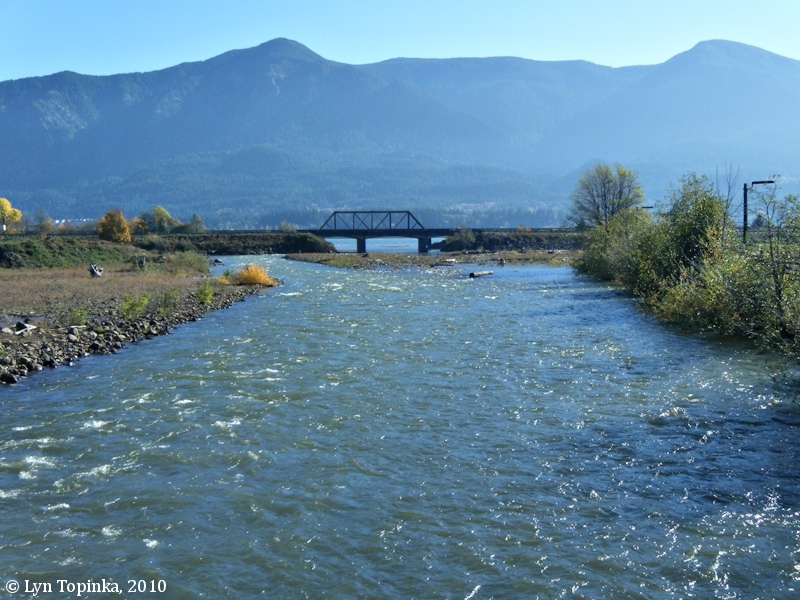 "Rock Creek, Washington ... (Skamania County)"
Click image to enlarge Rock Creek, Skamania County, Washington, looking upstream. View from walking bridge across Rock Creek, looking upstream towards Rock Cove Drive. Image taken November 2, 2010. 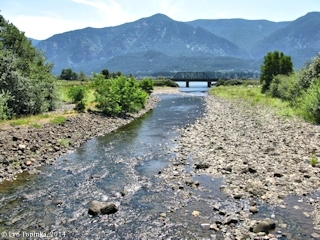 The Rock Creek watershed drains 43 square miles, with headwaters near Lookout Mountain, Washington, at an elevation of over 4,000 feet. The mouth of Rock Creek empties into Rock Cove and the Columbia River just west of Stevenson, Washington, at Columbia River Mile (RM) 150. Lewis and Clark pass by Skamania County's Rock Creek and Rock Cove on October 30, 1805. The creek is depicted but nameless on their route map (Moulton, vol.1, map#78). The 1860 cadastral survey (tax survey) for T2N R7E has the creek labeled "Rock Creek". The Creek has two mouths. 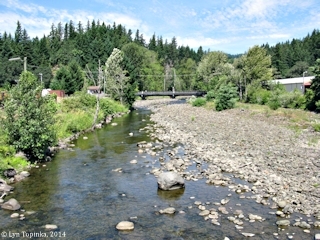 Click image to enlarge Rock Creek, Skamania County, Washington, looking downstream. View from walking bridge across Rock Creek, looking downstream towards Highway 14. Image taken November 2, 2010. Click image to enlarge Railroad bridge over Rock Creek, Skamania County, Washington. View from moving car on Washington State Highway 14. Image taken November 2, 2010. 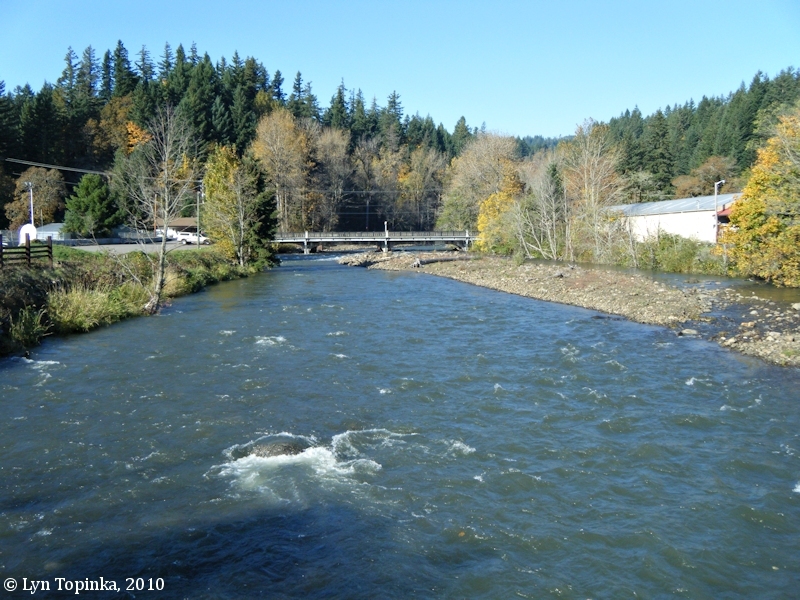 Click image to enlarge Rock Creek, Skamania County, Washington, looking upstream. View from walking bridge across Rock Creek, looking upstream. Image taken July 31, 2014. 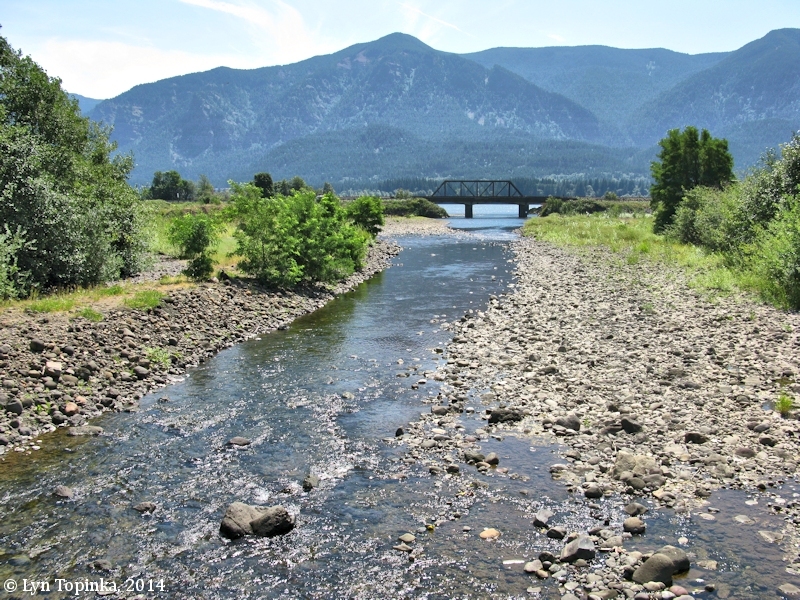 Click image to enlarge Rock Creek, Skamania County, Washington, looking downstream. View from walking bridge across Rock Creek, looking downstream towards Highway 14. Image taken July 31, 2014. 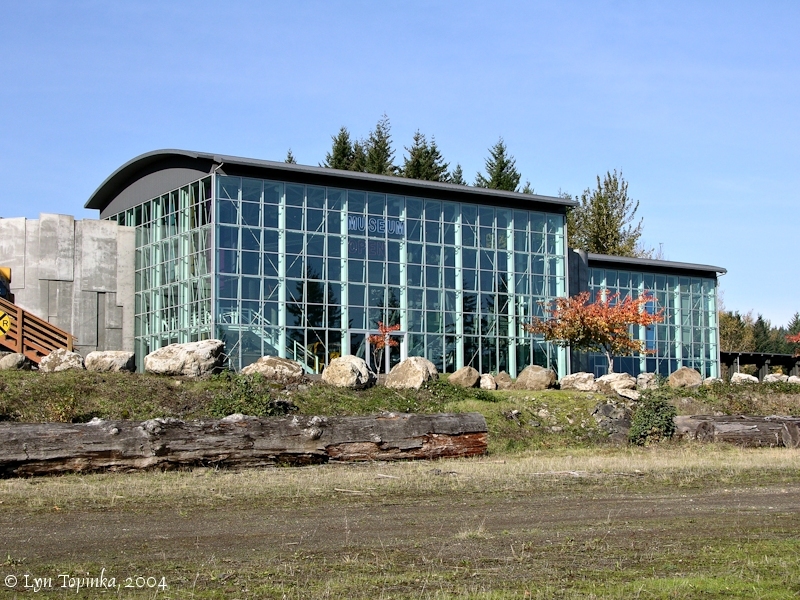 The Columbia Gorge Interpretive Center, located at the western end of Rock Cove, is the nonprofit museum of the Skamania County Historical Society, and is dedicated to preserving, exhibiting and interpreting the cultural and natural history of the Columbia River Gorge. The center is located on Rock Creek Drive, in Stevenson, Washington. 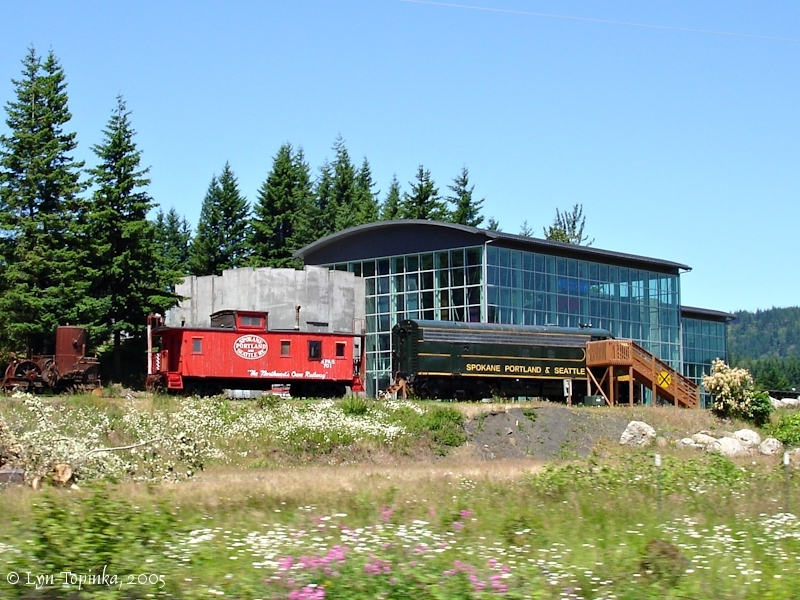 Click image to enlarge Columbia Gorge Interpretive Center, Stevenson, Washington. Image taken November 4, 2004. 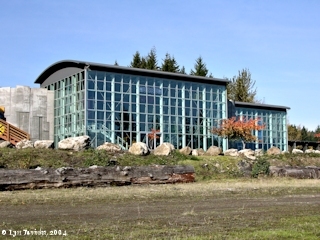 Click image to enlarge Columbia Gorge Interpretive Center, Stevenson, Washington. SP&S Engine 802 and SP&S Caboose 701 can be seen outside of the museum building. View from Washington State Highway 14. Image taken June 19, 2005. Rock Cove is located in Skamania County, Washington, and is a beautiful cove of small treed islands. Rock Creek empties into Rock Cove at its eastern edge before merging with the Columbia River at River Mile (RM) 150. Washington Highway 14 crosses Rock Cove. Upstream is Stevenson, Washington and downstream is Ashes Lake. The Rock Cove area is the upper end of the former Cascade Rapids, now drowned by the backwaters of Bonneville Reservoir. 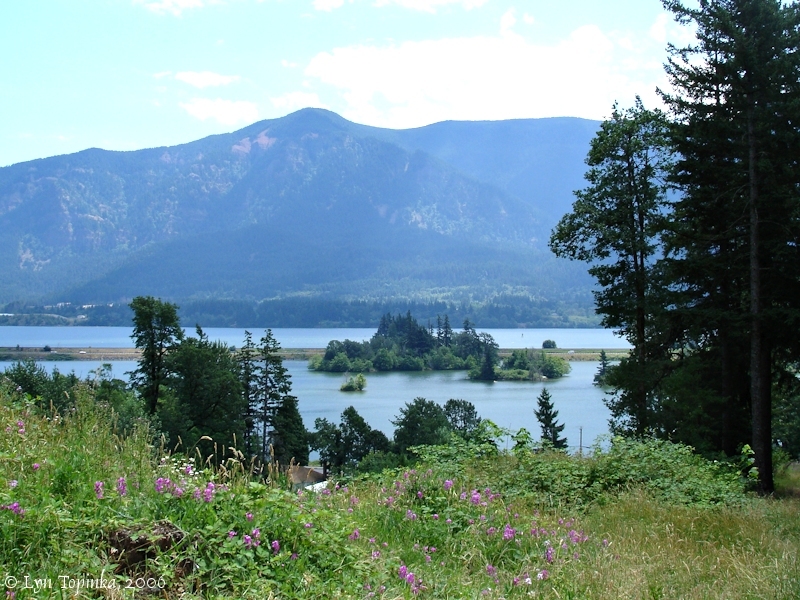 The Skamania County Fairgrounds lies on Rock Cove's northeastern edge and the Columbia Gorge Interpretive Center lies on its western edge. Click image to enlarge Rock Cove, Stevenson, Washington. View from Rock Cove Drive. Image taken November 4, 2004. 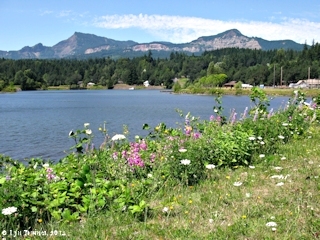 Click image to enlarge Rock Cove, Skamania County, Washington, with Table Mountain, Greenleaf Basin, and Greenleaf Peak in the background. Image taken July 31, 2014. 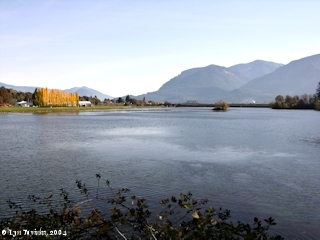 Click image to enlarge Rock Cove, Stevenson, Washington. View from road above Rock Cove. Image taken July 2, 2006. Lower Rock Creek Falls is a narrow falls (around 10 feet wide) which drops nearly 70 feet into a gorge of Rock Creek. 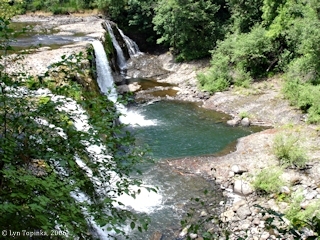 Lower Rock Creek Falls is a natural barrier to anadromous fish. Upper Rock Creek Falls is a wide waterfall (over 150 feet wide) which drops 45 feet over a conglomerate ledge. It is located one mile from the mouth of where Rock Creek enters Rock Cove, and is near the Iman Cemetery. Click image to enlarge Upper Rock Creek Falls, Stevenson, Washington. Low flow. Image taken July 2, 2006. 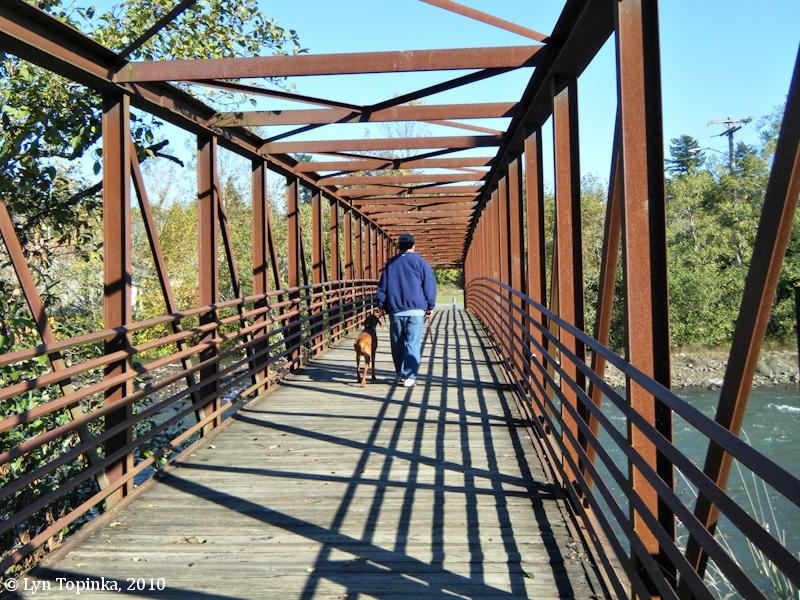 A small pedestrian bridge crosses Rock Creek at the Skamania County Fairgrounds. Presumably (having never been to the Skamania County Fair) it is for parking for the Fair. 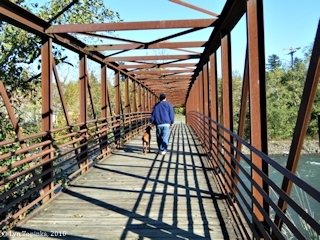 Click image to enlarge Walking bridge, Rock Creek, Skamania County, Washington. Image taken November 2, 2010. Penny Postcard: Rock Creek Falls, Skamania County, Washington, ca.1930. Penny Postcard, ca.1930, "Upper Rock Creek Falls, Evergreen Highway Along Columbia River, Washington." Photo by Wesley Andrews. Published by Wesley Andrews Co., Portland, Oregon. Card #553. In the private collection of Lyn Topinka.